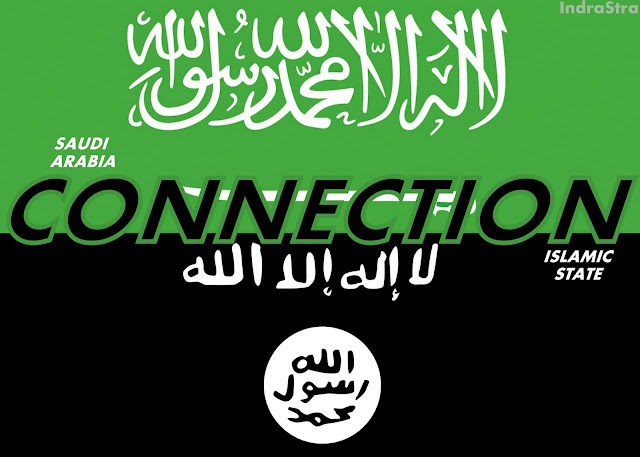 Many claim that the relationship between Saudi Arabia and Islamic State (IS) is one of patron and client. IS, they argue, is a pawn of the Saudi regime, used to check the ”rising”Shi'a power of Iran in the Middle East. This allegation typically presents certain shared principles between the official Saudi interpretation of Islam and the doctrine motivating IS as damning evidence of complicity between the two. Although there is a certain truth to this, it assumes a willful agency on Saudi Arabia’s part that simply isn’t there. Saudi citizens supporting IS’s activities in Iraq and Syria are not the result of a coherent plan directed by the kingdom’s rulers, but the overflow of a long-standing system used to maintain its domestic legitimacy. The Saudi state has relied on the ultra-conservative Wahhabi movement since both emerged in the mid-18th century. Wahhabism was built on the desire to stamp out religious innovation and restore the “proper” Islam. Its initial power rested on two sources – the common distaste among the inhabitants of Central Arabia for such innovation and preacher Muhammad Abd al-Wahhab’s ability to channel this grievance into a populist doctrine. The call produced something never encountered before in the region: a proper mass movement. The Saudis, a small clan of oasis nobility, formed a symbiotic relationship with Wahhab. It lent him military support in return for the movement’s resources and legitimacy. Wahhab agreed to defer all matters of state and politics, restricting clerical activities to administering the social and metaphysical spheres. As “guardians” of Islam, the Saudis were able to differentiate themselves from their local competitors. Revivalism attached a mass appeal to their mission of conquest in an environment typified by disparate local identities and “petty sheiks”. 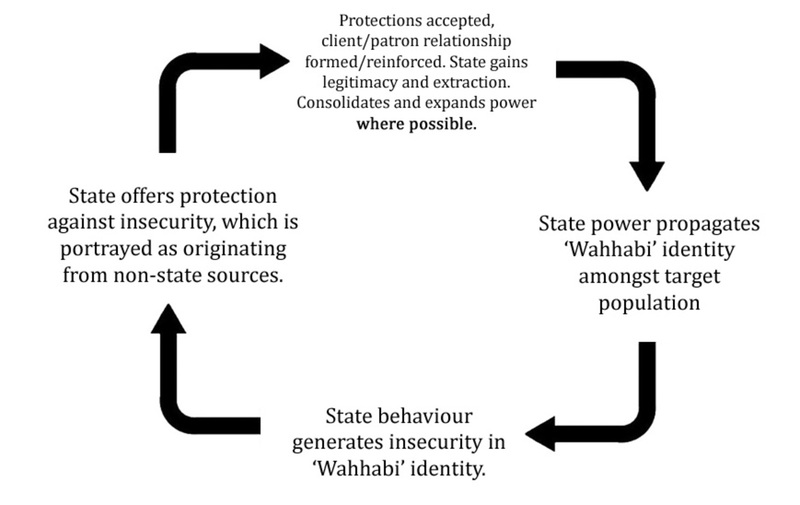 The resultant state came to be viewed as key to safeguarding the Wahhabi community, a central factor in its expansion over much of the Arabian Peninsula by the late 19th century. Realising the importance of the ongoing ideological support of its subjects, the Saudi regime sought to instil Wahhabism throughout conquered territories. The primary motivation for Saudi leaders was political. By instilling the revivalist identity into greater numbers of its subjects, the state was creating demand for its own rule. Key to this effort was the securitisation of heterodox sects, such as the Shi'a. These “others” were presented as a threat to the community’s metaphysical integrity due to their inauthentic practices, which were not encountered during Islam’s early period. The logic dictated that their existence necessitated a higher authority to moderate society and ensure the correct Islamic form was maintained. This is hardly a novel concept. States commonly construct threats of external war and terror in order to gain domestic power. A by-product of such activities has often been the rise of destructive exclusivist nationalism and xenophobia. Where the Saudi state remains novel is in its use of a purely metaphysical threat, the extent that it has relied on this to maintain its position, and the longevity of the effort itself. The state’s arms have commonly been employed to ensure this status quo. Saudi Arabia’s education system has been criticised for promoting a radicalising, sectarian narrative that encourages violence against those outside the sanctioned community. But while Saudi Arabia has carefully crafted an image as Islam’s protector, it nevertheless has aimed to keep policymaking pragmatic, not ideological. Decisions of economic and foreign policy have tended to be dominated by technocrats, not clerics. In this, religion is often invoked, but generally when it is instrumental to a wider political goal. Ironically, for Saudis this arrangement has meant that the state has been a prominent promoter of the “innovation” so detested in classical revivalist thought. This tension has occasionally produced outbreaks of violence. The 1927 Ikhwan revolt was sparked in part by King Abd al-Aziz’s refusal to exterminate the Shi'a of al-Hasa and his diplomatic relations with external “infidel” powers. Similarly, the 1979 Siege of Mecca was a rejection of the previous two decades of radical modernisation initiated by King Faisal. The 2003 attacks by al-Qaeda inside Saudi Arabia were partially motivated by its accommodation of “infidels”. Historically, this blow-back has been largely domestic. Only since the 1990s have these types of unintended outcomes been felt internationally. This shift can be attributed to several factors. The most prominent among them was Saudi Arabia’s tacit support for participation in the Afghanistan wars of the 1980s. The primary motivation for this was not one of ideology, but political pragmatism. Saudi Arabia was experiencing an economic downturn in which household incomes fell by more than half and unemployment skyrocketed. At the same time the regime was struggling with a rising Islamist current in the wake of the Iranian revolution, which was increasingly calling into question its legitimacy to rule. With a large number of disenfranchised young men at home, a rival power walking into a geopolitical beartrap and a need to appear to the Muslim community to be increasingly activist, the decision was aimed at killing three birds with one stone. Thanks to its strong influence over domestic Islamic identity, it took little encouragement to mobilise thousands of young Saudis into a conflict with a new infidel threat. Although Saudi Arabia began actively discouraging such behaviour after the Soviet withdrawal in 1989, the genie had been let out of the bottle. Saudis continued to flock to “pan-Islamic” conflicts throughout the 1990s and the 2000s – in Kosovo, Tajikistan, Chechnya, Iraq and, most recently, Syria. They gravitated towards religiously hardline groups, whose ideologies meshed well with the sectarian narrative of their upbringing. While Saudi Arabia has made several attempts to stem the flow of fighters and finances to groups like IS, it has been careful not to appear overly oppressive for fear of antagonising its own constituents. It may decry such groups, but it continues to promote a system that inadvertently supports them. Revivalist scholars claim that Saudi Arabia’s doctrine is intrinsically opposed to the IS worldview. They cite esoteric textual minutiae to support such assertions. But such arguments miss a wider point: the issues at play are far less about literary nuance than the wider emotional, psychological and sociological themes that Saudi Arabia promotes in its populace. Such structures created a demand for sectarian confrontation in some people that cannot be met by the state and which drives them towards radical action. Until such deeper issues are dealt with, other responses will merely be token. Unfortunately, the domestic efficacy of Saudi Arabia’s control means that it is unlikely to be reformed any time soon. The state’s manipulation of its population’s sectarianism during the Arab Spring, for example, was key to its effective management of the 2011 crisis. Within this wider context, the ruling elite see the extremist habits of a small number of Saudis as an unfortunate yet tolerable side-effect of a system that has allowed them to remain in power for nearly 300 years. This certainly does not diminish the Saudi state’s culpability. But it does pose the question: how does one change an entire system of popular governance that inadvertently produces such outcomes and appears structurally incapable of preventing them?